Hello there! We have a special course released today: Deep Learning in Python by Dan Becker. This happens to be one of the first online interactive course providing instructions in keras 2.0, which now supports Tensorflow integration and this new API will be consistent in the coming years. So you've come to the right deep learning course. Artificial neural networks (ANN) are a biologically-inspired set of models that facilitate computers learning from observed data. Deep learning is a set of algorithms that use especially powerful neural networks. It is one of the hottest fields in data science, and most state-of-the-art results in robotics, image recognition and artificial intelligence (including the famous AlphaGo) use deep learning. In this course, you'll gain hands-on, practical knowledge of how to use neural networks and deep learning with Keras 2.0, the latest version of a cutting edge library for deep learning in Python. 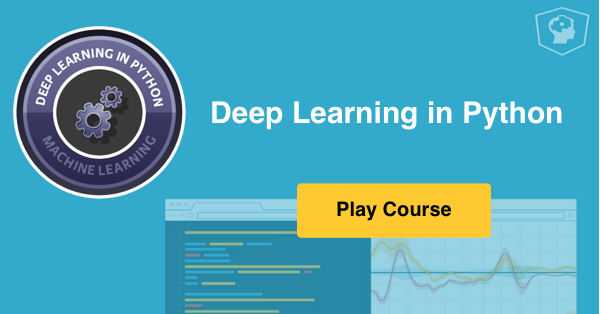 Deep Learning in Python features interactive exercises that combine high-quality video, in-browser coding, and gamification for an engaging learning experience that will make you a master in deep learning in Python! In the first chapter, you'll become familiar with the fundamental concepts and terminology used in deep learning, and understand why deep learning techniques are so powerful today. You'll build simple neural networks yourself and generate predictions with them. You can take this chapter here for free. In chapter 2, you'll learn how to optimize the predictions generated by your neural networks. You'll do this using a method called backward propagation, which is one of the most important techniques in deep learning. Understanding how it works will give you a strong foundation to build from in the second half of the course. In the third chapter, you'll use the keras library to build deep learning models for both regression as well as classification! You'll learn about the Specify-Compile-Fit workflow that you can use to make predictions and by the end of this chapter, you'll have all the tools necessary to build deep neural networks! Finally, you'll learn how to optimize your deep learning models in keras. You'll learn how to validate your models, understand the concept of model capacity, and experiment with wider and deeper networks. Enjoy!